Shown below is a thin transgressive lag developed at a flooding surface. The light color of the lag beneath the hammer head comes from the relatively high quartz sand and bioclastic components. 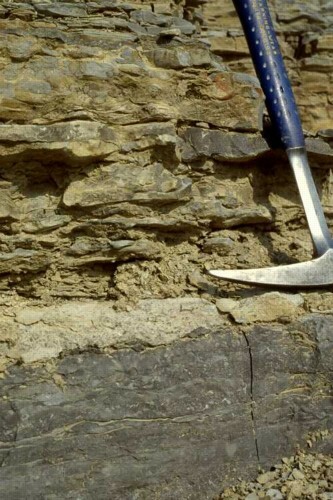 This photograph is a closeup of the flooding surface example from the Middle Ordovician Chickamauga Group near Fort Oglethorpe, Georgia.